With meditating, it’s best to start small. Try meditating for five minutes a day, and once you are comfortable with that, move it up to 10 minutes, and so on. 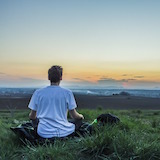 Meditating will increase both your self-awareness and self-control. It will help calm your mind and improve your focus. With consistent meditation, you will be able to easily say no to your impulses and focus on more productive activities. Sit comfortably and be still. Whether it’s on your chair or on the ground, make sure you’re in a position you can sit still in. Even if your nose has an itch, fight the impulse to scratch it. In your mind, say “inhale” and “exhale” with each breath. Focus on this, and this only. Redirect your mind whenever it begins to wander. If you want to keep your eyes open, that’s fine too! Keep them focused on a single spot (say, on the wall) to limit distractions. Notice how your body feels while you breathe. After a few minutes, pay attention to your chest and/or belly inflating and deflating. You don’t have to say “inhale” and “exhale” in your mind anymore, but you must keep your mind focused on your breathing.